You are here: microTOOL / Knowledge Base / What is a stakeholder analysis? What is a stakeholder analysis, how are stakeholders identified and how do you communicate with stakeholders? 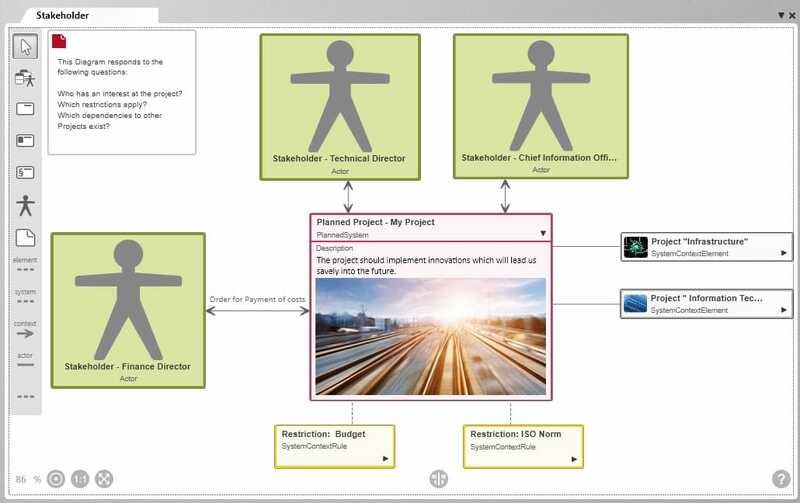 Different information can be visualized in a stakeholder diagram, for example, selected stakeholders witht heir interests in a projcet, restrictions of the project or relations to other projects. Should you visualize all the stakeholders in a stakeholder diagram? Probably not, because it is not about complete detail in thse diagrams, but about important connections. It is recommended to present important stakeholders with more influence. The stakeholder “Finance Director” – in concrete projects a real person with the role/function “Financial Director” is largely interested in costs, wants to control these and make decisions. Stakeholder analysis is concerned with the systematic determination of natural people like customers, users or employees as well as legal personnel, institutions or organizations that are interested in a project, a solution or a service that is being created. These people are called stakeholders. Stakeholder analysis maps the foundation for interaction between businesses or organizations and the stakeholders who are interested in the development or in the project. It is, along with stakeholder identification and stakeholder communication, a part of stakeholder management. Identify, analyze and communicate – those are the three essential tasks in stakeholder management. Their interest is gaining capital. Their goal is to achieve economic success. People or organizations who contractors commission to supply or create a product. The product or service fulfils a defined use for the client. People or organizations who manufacture a product or a service or create products and services for the client. They want reliable customers because their success depends on it. They want a product of the highest possible quality, and/or for a cheap price, corresponding to their needs, that will last as long as possible. Users are comparable with customers. However, a customer is not, for example, a user of a software that has been implemented throughout a business. The purchase costs are not important here, because users do not pay for the product themselves. Even employees often have an interest in a project, although these can be very different. Developers want to design and manufacture good products. Project managers want to finish a project according to schedule, within budget and to a defined quality. And management wants to gain new customers and market shares with new solutions so as to increase profit and turnover. They are interested complying with norms, rules and legislation. They approve or reject releases. The success of a business is not important to them. They are also interested in other manufacturer’s innovations and need knowledge for their own development. Many competitors can also be glad about other manufacturer’s failures. They are interested in the success of your project or business, because they want bills to be paid or loans and credits to be paid back. These are just a couple of examples. Even media representatives, external organizations, clubs, associations or private public partnerships can be stakeholders. In most projects there are many stakeholders. And the motivations of each vary greatly in reality. Not every user has the same interests as another user, not every investor is happy with a return of 5% and not every customer is prepared to purchase products from the Far East. So it’s worth analyzing the concrete interests of a stakeholder. With the identification of stakeholders, it is about the discovery and recognition or people who are interested in a project, a product, etc. To ensure that all stakeholders can be identified, you can use available stakeholder lists (check they are up-to-date and complete first!) or stakeholder checklists. Stakeholder identification is the foundation of stakeholder analysis. Stakeholder analysis investigates stakeholders with regards to attitudes and expectations of a project. It asks about the roles. It determines decision-making potential that can be of a technical, political or financial sort. It asks about the influence of individual stakeholders and the influence of the project itself. Through stakeholder analysis, you gain important information early on, can recognize goals or discover conflicts between participants. List of the names of all stakeholders including documentation of interests and goals. Evaluation of the influence of the stakeholders, for example, in levels (low, medium, high influence on the project and/or on the other project participants). Evaluation of the attitudes of the stakeholders, for example, a division into positive, negative and neutral, or opponent, supporter or neutral with reference to the project. Documentation of the stakeholders’ fields and depths of knowledge and their experiences. Where appropriate, graphic representations of the results in a stakeholder diagram or a goal diagram. Considerations of which contribution (Expert knowledge, methodology, etc) individual stakeholders perform for the project and which tasks could be transferred. Prioritization of the stakeholders as a result of the stakeholder analysis. The stakeholder analysis should be questioned over the course of the project and, if possible, updated. If you want to or have to trace the course of a project at a later time, it is also recommended to make versions of results. That way you are in a position to answer questions about changes and developments in the project due to changes with stakeholders. Stakeholder analysis is always just a snapshot, because the interest of a stakeholder can change over the course of the project. How can you find out what a stakeholder wants? There are four basic techniques available to determine the explicit and implicit knowledge of the stakeholders. The techniques that should be implemented depend on both questions of the project conditions as well as the competence of the requirements analysts. As well as that, the question arises of which type of knowledge should be specified (conscious, unconscious or subconscious)? Survey techniques serve to determine explicit knowledge. This requires that those surveyed be able to express the knowledge. Examples of the survey technique are Interviews and Surveys. Creativity techniques are used to develop a vision of a system with innovative requirements. Here, the focus is on ideas, not details. Examples of this type of technique are Brainstorming and Changing Perspective. Document-centered techniques serve for the inclusion of already recognized solutions and experiences in a new system. It should be used in combination with other techniques. Examples are System Archeology and Perspective-based Reading. Observation techniques are helpful in situations in which experts no longer have the opportunity to formulate their knowledge. The stakeholders are then watched at work to collect the necessary information. Examples of this technique are Field Surveillance and Apprenticing. Stakeholder analysis is the foundation of successful stakeholder communication. How do you communicate with stakeholders? You have identified and analyzed your stakeholders. Ideally you have also carried out a prioritization, because not all participants are as important as each other for a project or a business. Now it is worth developing a communication plan and determining how and how often to communicate with whom. Through communication, you get early feedback, opinions and impressions, encouragement or opposition. This information is important to successfully design your project and avoid conflicts. Adds up the workload and return for participants, that means the relationship between the amount of detailed information and the gain of information is balanced. Can vary the amount and depth of information (e.g. external clients probably don’t need to get all internal memos). Adapts the form (verbal or written) to the recipients, maybe also depending on the meaning of the information. Catches on to all employed mediums, like e-mails, phone calls, tweets, Facebook messages, What’sApp messages, blogs, etc. Corresponds to the type of documentation of the situation (files, letters, e-mails, progress reports, problem reports, technical specifications, protocols, etc). Defines the language and mediums being used (diagrams, notations, graphics, dashboards, etc). Provides escalation levels, e.g., if quick decisions have to be made. Communication is not one-sided, the stakeholders communicate with you, too. And you communicate amongst yourselves. Have you defined the framework under which this happens? Do you set up discussion groups, enable an exchange in open spaces, define a primary contact person for the field? The possibilities are diverse. So you don’t know who your stakeholders are? That’s not good. But don’t worry: you can change that. Try the following: ask lots of questions that begin with “who”. For example: “Who is financing the project? Who could oppose it? Who is working on the project?” Once you start you will begin to think of many questions like these. Then what? Then try using a tool to help you to gather the information and share it with others.